The Fox family made an exciting purchase/investment (Foxy Lady calls it a “purchase” and Stocky calls it an “investment”, with the distinction leading to extensive debate) this week—solar panels. I guess you can take the fox out of California, but you can’t take California out of the fox. For those of you who like to bottom-line it, our solar panels are going to give us an 9% investment return, all the while reducing our carbon footprint by about 9 tons of CO2 annually. Back in California, solar panels were really taking off. On our street alone we probably had four or five neighbors who put solar panels on their roof. Since we have moved to North Carolina, literally I have yet to see a house with solar panels. Back in California, Foxy Lady and I had agreed that we would take the plunge and get solar panels, but we were waiting for the falling prices to stabilize. Once we figured that we were going to move, we put those plans on hold until we settled in our new home. We bought a 20-panel set-up, with each panel being a 265 watt array (they are about 6 feet long and 3 feet wide). The all-in cost was $18,900, and that included everything from the panels to installation to all the permitting with the state and energy company. When all the dust settles, I won’t end up paying $18,900 but quite a bit less. First, there are massive tax incentives when you install solar panels. The federal government gives you a 30% tax credit on your purchase. The state of North Carolina also had a big tax break but they discontinued it at the end of 2015, so I missed out on that which was a bummer. There is financing available, but since I was paying up-front, I got a 6% discount. Plus, I was able to pay with a credit card, and since it was such a large purchase I played credit card roulette and saved another $1300. When you add all that up, our net price was $11,000. How does it work with your electric bill? The solar panels are installed on our roof, and when the sun shines on them they product electricity—that’s the whole point. Then there’s this thing called “net metering”. Basically that means that during the day, when the sun is shining on our panels, we’re producing more electricity than our house is using. That excess electricity goes into the power grid, and our meter actually goes backwards. Then at night, when the sun isn’t shining, we’re using power from the grid and our meter goes up, as normal. So the “net metering” is when you take all the power we used and subtract the power our solar panels generated. That’s a pretty sweet deal for us because we get the use and reliability of the power grid, but only pay for a fraction of it. As you can imagine, the power companies are trying to move away from this system to something where you buy electricity at retail and then any excess power you put back into the grid you sell at wholesale. Politically it’s a hot potato as states want to encourage solar panels and other renewable energy, so they’re keeping net-metering, at least for now. For us, since we got in with net-metering we’ll be grandfathered in if the law changes, but that’s a big factor in all this. How did you figure out the financial return? As you would expect, I ran the numbers a thousand different ways to understand what type of return I would get for this investment. 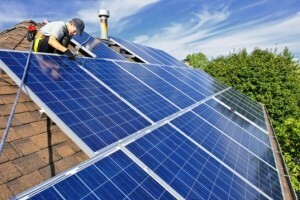 First, you have to estimate how much electricity your panels will produce. As I said, we got 20 panels each with a 265 watt capability. That comes to 5300 watts, but that would be in 100% perfect conditions. When you factor things like the angle of our roof, and more importantly the direction of our roof, you end up reducing that by 22%. Just in case you’re curious, south facing roofs are the best and for those you would reduce by 15%. Our roof facing almost due west, with a slight southern slant. Then you have to estimate the number of sunlight hours per day. The government has rated all the municipalities for this calculation, and western North Carolina comes in at about 6 hours per day. Of course, that factors in clear days during the summer when you’ll get 14 hours of sunlight, cloudy and rainy days, and winter days. Put that all in and it’s supposed to average 6 hours per day. You can do all the math and you get about 25 kilowatt-hours per day or about 750 kWh per month. Our current electric rate is about 10¢ per kWh, so we expect this investment to generate about $75 in savings per month. A $75 monthly return on a $11,000 investment comes to about 7% return. If you factor in that electricity rates will probably rise about 2% per year, the return goes to 9%. 9%!!!!! Remember that in the stock market returns average about 6-8%, but there are major ups and downs, like what we went through last year. This is 9% pretty much guaranteed. The closest thing you could compare it to is a 30-year US bond, and right now those are returning about 4%, so this is over double that, and we all know how important an extra 1% return is. Yowza!!! Of course, the proof of the pudding is in the eating. Over the next bit, I’ll find out how many kilowatt-hours our solar panels actually generate, and I’ll find out if electric rates go up that fast or not. Those will obviously impact our return, possibly dramatically. I did a quick sensitivity analysis that shows worst-case the return is 4% and best case it’s 10%. Obviously that’s a big range which would drastically impact if this is a good investment or not, so stay tuned and I’ll provide more detailed updates on this as I see how we’re tracking. How did you figure out the environmental return? The other major benefit, and some would say the more important benefit, of solar panels is the environment. We are generating pollution-free energy to power our house. There’s no coal or natural gas or oil that is being burned to generate those 750 kilowatt-hours which means there are no carbon emissions. I know some people question the role of carbon dioxide on global temperatures, but I definitely think that it has a negative impact, and I want to do what I can to help. If in doing so I get a really good financial return, all the better. Those 8,390 kWh per year, if generated at a coal power plant, which is where our normal power comes from, would be over 9 tons of CO2 each year. That certainly seems like a lot. Just to put it in perspective, Foxy Lady drives a Honda Fit and I drive a Toyota 4-runner, and together those generate about 6 tons of CO2 per year. Basically our solar panels will eliminate the carbon footprint of our cars, and have some carbon offset left over for one more car. To me, that’s a pretty big deal to me. There are three major risks that I see. First, we need to see what type of power the panels actually generate. The math says it should be about 9000 kWh per year, but we’ll see. As we said above, that number can have a huge impact on the type of return we get. Second, this is a long-term investment. The payoff for the panels is about 11 years. That’s a long time and a lot of stuff can happen. The warranty on the panels is 25 years, so we should be okay there. But what if we move? Will the new buyers pay extra for the panels? Who knows. Third, and this is the biggie, is the chance that Duke Energy changes their rules. We mentioned that net metering is a huge advantage to all of this, and we’re supposed to be grandfathered with that. But laws can change and sometimes people get screwed. If we got taken off net metering to a less advantageous system, this investment would take a real nosedive. There you have it, the first chapter in our story on solar panels. There’s a lot that we need to see play out, so I’ll keep you updated. But going in to this, I think it’s an amazing opportunity to do something great for the environment (taking 3 cars off the road), as well as an awesome investment return (9%+). Hi Mr. Fox, which credit card are you using? How can you get a credit card roulette for 7%?